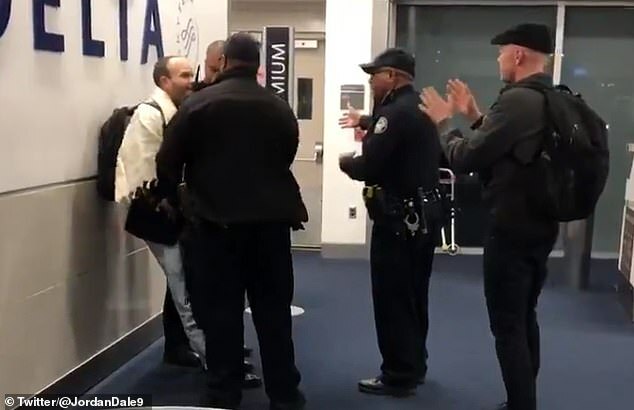 A bizarre incident on a flight from Washington DC to Atlanta on Wednesday night resulted in the arrest of a Jewish man after passengers claimed he launched into an 'anti-Semitic' rant. The video shows the man, who has been identified as David Toaff, trying to avoid police while they attempt to take him into custody. The entire incident was captured on camera by one of the passengers on the flight, Jordan Dale. 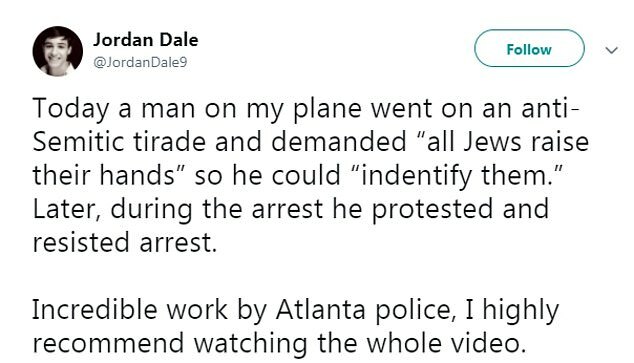 'Today a man on my plane went on an anti-Semitic tirade and demanded "all Jews raise their hands" so he could “identify [sic] them.” Later, during the arrest he protested and resisted arrest,' wrote Dale on Twitter. Toaff was eventually booked into the Clayton County Jail, but has not been charged with making any sort of hate speech. He has instead been charged with disorderly conduct and obstructing or hindering law enforcement. Toaff's inmate details reveal that he lives in Washington DC and that his middle name is Shlomo. The video seems to show that the charges Toaff is facing are the result of his behavior after the flight landed, and not any remarks he made while the flight was in the air. Atlanta Airport Police can be seen doing their best to try and reason with Toaff, but he refuses to cooperate. 'You're making it worse for yourself,' one of the officers says at one point in the video. He was booked at 10:30pm and is being held on a $1500 bond and $350 fee for the disorderly conduct charge, while there is no cost attached to the second count.